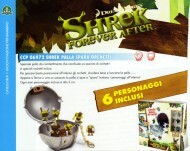 € 15.00 PUPAZZI IN PELUCHE DEI PERSONAGGI DI SHREK E CIUCHINO !!! PUPAZZI IN PELUCHE DEI PERSONAGGI DI SHREK E CIUCHINO !! PUPAZZI IN PELUCHE DEI PERSONAGGI DI SHREK E CIUCHINO !! !